A Lesson for Believers…from Stryper. This is a post that’s been brewing in my head for months, so follow along. It’ll be worth it. 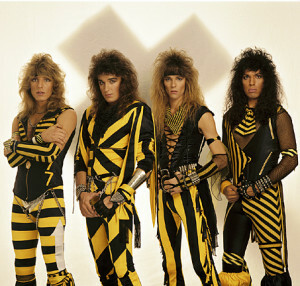 Stryper came into the glam/hair metal scene in the early 80’s, opening for bands like Ratt and Bon Jovi, and are quite often remembered by their iconic black and yellow striped outfits and instruments. And yet, in the midst of that culture, they were undoubtedly Christian, prominently displaying the verse from which they derived their name, Isaiah 53:5. And during concerts, they threw Bibles out to the audience. Yes, they were gimmicky. But they achieved a level of success that few bands–Christian or otherwise–did, with their third album, To Hell with the Devil, going platinum in three months. And guess what? They are still recording and touring…which is something very few bands from the 80s can say. More importantly, and this is something that struck me when listening to SiriusXM’s Hair Nation channel: they are still played and their frontman, Michael Sweet, is highly respected as a musician. So what lessons could there be for us, as believers? They didn’t hide their beliefs, nor did they partition their personal beliefs from their professional life…they integrated their beliefs. Integrate your faith. They played in the same places, to the same crowds, as the other bands of the day…not in the safety and security of churches or Christian festivals. I’m not saying those things don’t have their place, but I am saying it is easier to live your beliefs with those who share those beliefs. Don’t seek safety. They didn’t offend. They didn’t beat people over the head with their faith, or tell them they are going to hell. They just shared their music and their faith. Don’t offend…just share. Just as important as the above, they were respected as musicians, and still are. Seek excellence in what you do.